This chili recipe is gluten-free as written (just be sure your garnishes are also gluten-free), and vegan (unless you top it with dairy products like sour cream or cheese). For the those that love chili.. and are vegetarian. Heat oil in a large saucepan over medium heat. Saute onions, carrots, and garlic until tender. Stir in green pepper, red pepper, celery, and chili powder. Cook until vegetables are tender, about 6 minutes. Stir in mushrooms, and cook 4 minutes. Stir in tomatoes, kidney beans, and corn. Season with cumin, oregano, and basil. Bring to a boil, and reduce heat to medium. Cover, and simmer for 20 minutes, stirring occasionally. 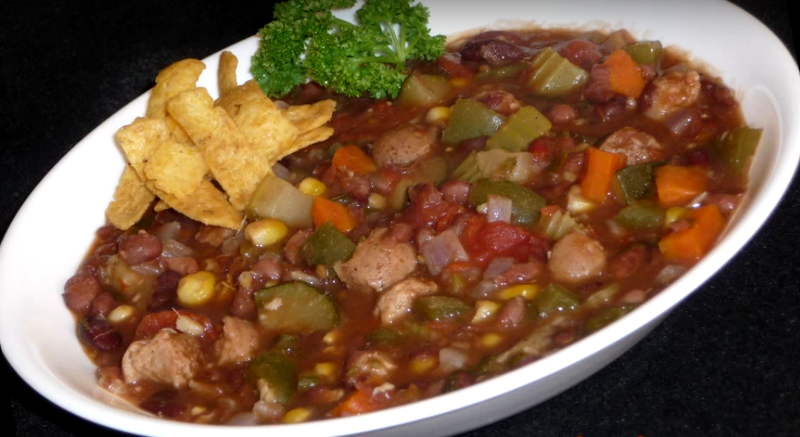 When you get the hang of this recipe, keep things interesting by varying the types of beans you use or swapping the chilies for some hotter varieties, if you like.